Admin | Blackhill Bounders Running Club. I love flat, fast races on the asphalt. With that in mind I’d already eyed up the Redcar half marathon for the end of September. However, I’d noted on Facebook that a few club members were planning a trip west for the inaugural Haltwhistle half marathon the same day. 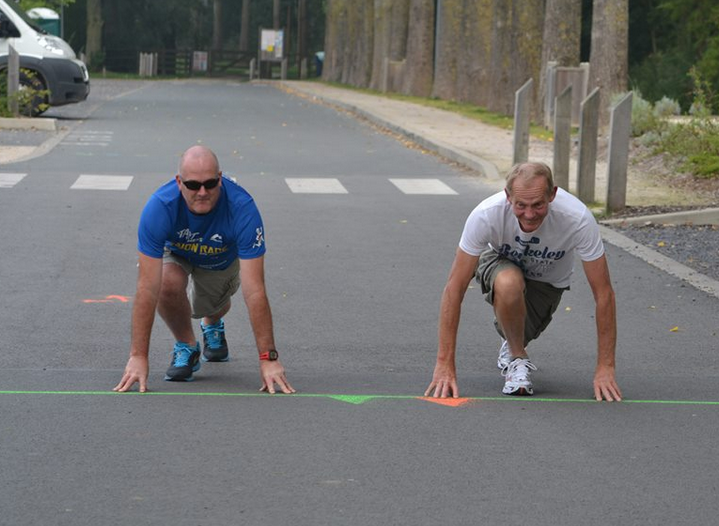 The pre-race advertising promised flat and fast too, however I still wasn’t swayed. It promised a scenic route as well. I’m a big fan of heavy industry and I’d take the rusty orange particulate soaked views of Teesport over Northumbrian countryside any day (seriously!). So Redcar it was to be. .
Until a neighbour and fellow runner (Davey Goodfellow) knocked on my door and offered me his spot in Haltwhistle . . . for free (thanks Davey). Conscious of my occasional tellings-off for spending too much money on races (despite one race a month costing roughly the same as a monthly nail job) I graciously accepted. Name swaps were sorted and a few weeks later my number arrived along with race instructions pointing out a section of the race where we would be required to walk. . . . Yes walk! 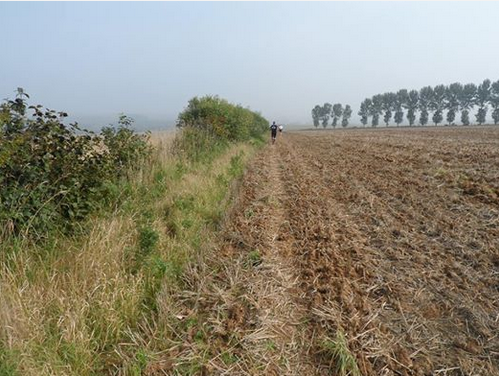 The route went through somebody’s garden who insisted upon the runners walking over his grass. After a minor hissy fit I soon calmed down and began practicing my ‘quick walk’ technique. Onward to Haltwhistle . . . the Bounders had an enormous presence. In a race of 200 or so there must have been 1/5 from Blackhill. 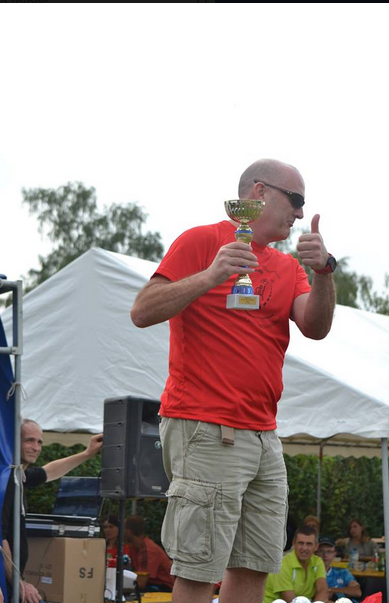 The organiser was suitably impressed enough to give the club a special mention during the presentation. As were four of my work colleagues who were along for the race too. For the race itself I had a goal of running sub 80mins. I’d done Edinburgh in May in 80.23 so was hopeful of shaving of that 23 seconds. It was cloudy but warm and humid and those who ran will recall the air was thick with little black flies. . Several of which were inevitably ingested. I had a canny race. It certainly wasn’t flat. There was a steady climb on the route, which we then descended on the way back following the turn at 6.5miles. The scenery. . Well I didn’t notice any. I got round under the 80minutes and snatched a surprise second place . . . for which I won £30 during a rather awkward presentation afterwards. Not quite enough to turn pro but it’s a start. As for the walk, well I think it cost me 20 seconds in total so no real loss. I’m told the alternative was to descend and then climb some steps . . . and I bl@@dy hate steps. They have no business being in races! Final word to thank all the support from fellow runners and supporters on route. I flew through that first mile after the turn when passing all of you on the way back down. It was a real boost. 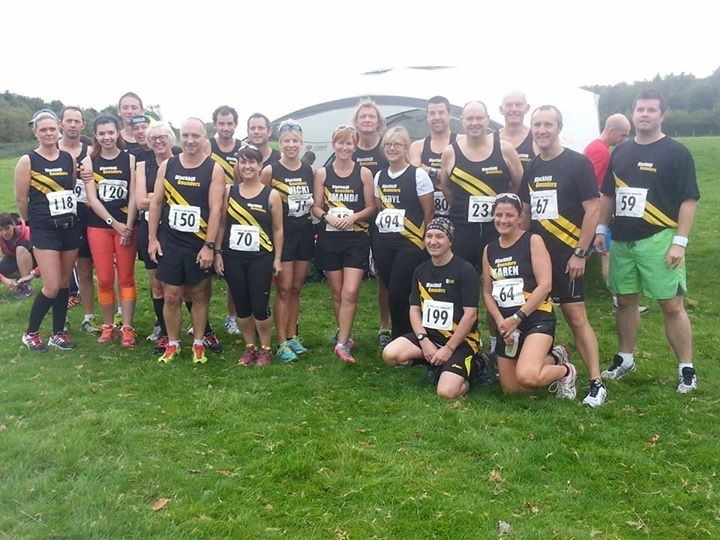 In Full This is the last race in the Esk Valley Fell Club summer series and a fundraiser for Cleveland Mountain Rescue. I’ve done a few of the series before but have never had the chance to run this one. It’s always a joy to be out on the North York Moors, so I was looking forward to it. Leaving the Black & Gold in the wardrobe, Jason & I were playing in the away colours of Northumberland Fell Runners for this one. We drove up the steep road up Carlton Bank to the start at Lordstones Café. Getting out of the car, it was freezing – a shocking contrast to the temperature when we left the house. Registration and a kit check & we were ready for the off. It didn’t take long to reflect on the title of the race and realise that anything with 4 peaks in the title wouldn’t be flat. In true fell running tradition, it was straight into an uphill which was steep but runnable. Not much time to get your breath back & into a difficult downhill down the steep flags on the Cleveland Way. These are the worst kind of terrain for me to descend & as I resembled Bambi tip toeing down them, a fair few people sped past me. Then it was back round past the start line & back into the second of the 2 peaks which was a bit more of a walk than a run. Determined to find a better line down the next descent and avoid the flags, I took a fell trod to the side of the path, following a few wiry fell runners who looked like they knew where they were going (they didn’t). Stuck in a tangle of bracken & ferns, I realised we’d all gone a bit wide of the line and we’d lost a fair bit of time & places trying to get untangled & back on track. The 3rd peak took us up onto the moor where the sidewind nearly blew me off my feet. Another downhill, then a quick sprint through a field of cows who had thankfully moved a little bit to the side & it was onto the final climb up to the Wainstones. 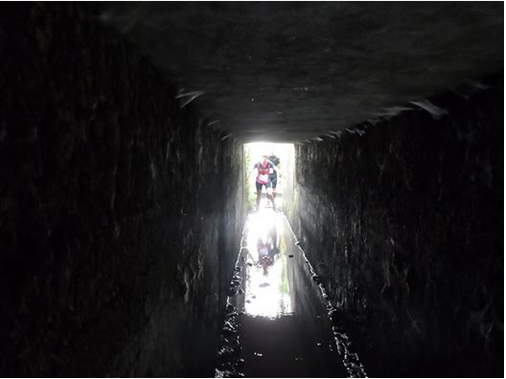 A final tricky descent down (again poorly executed) & then it was only 2 miles to the finish line. I was under the impression this was a flat run to the finish but it was still a bit undulating and my energy was now running low. 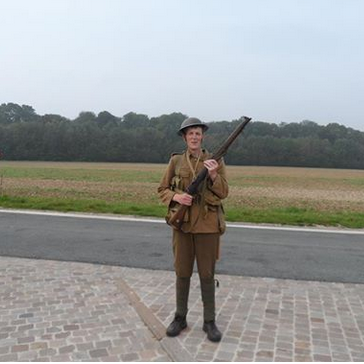 The Somme area of France has strong connections for Brits be it as a holiday destination or for a visit to some of the major sites of the battles which took place in the First World War. Despite it’s horrific history the area is a beautiful mix of rural village life and some elegant towns and cities. 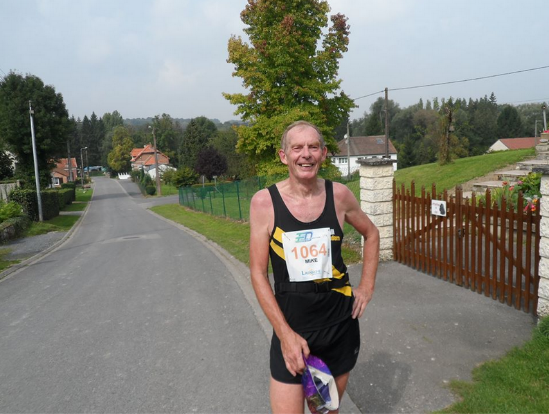 My running is limited to doing events as the knees won’t allow me to do the regular weekly mileage so I ‘train for the event’ by doing the event, so no quick times probably but plenty of enjoyment. 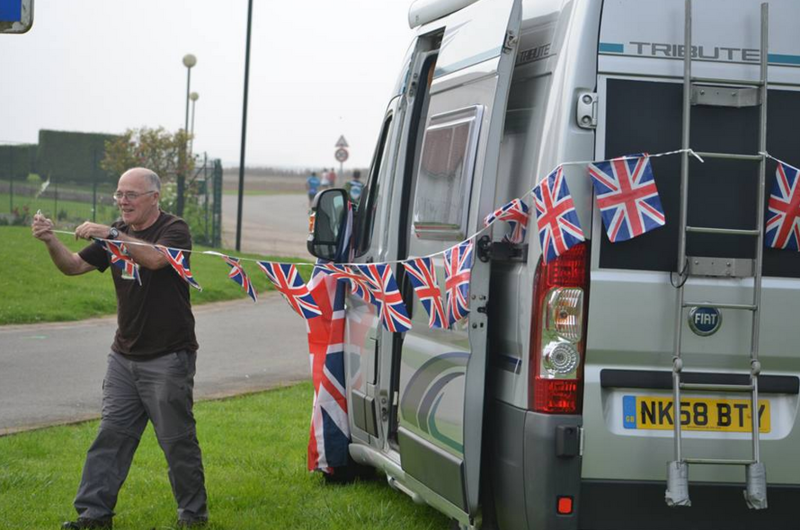 Ann and myself drove down on the Thursday and stopped overnight in the Maidstone Hilton before catching the 12 noon ferry to Dunkerque on Friday. Stephen and Lesley Daglish had an early start from Consett and joined us in Dover for the same ferry so good company already. 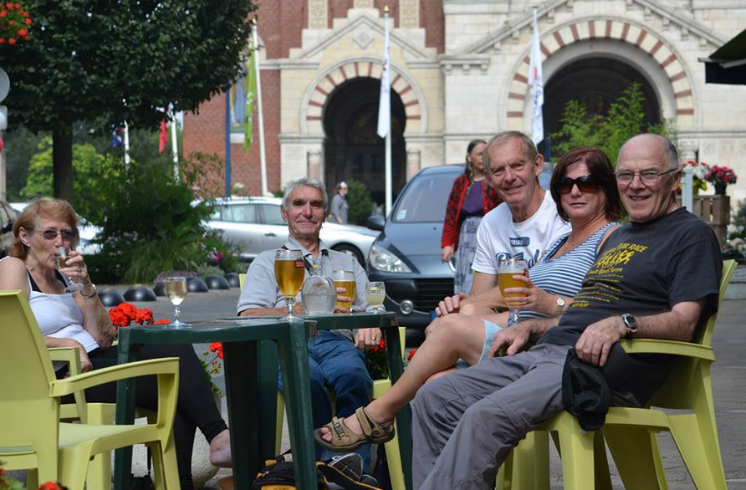 When we got to Dunkerque we set off for a 2 hour drive to Albert for me and Amiens for Stephen (only 18 miles apart) The third leg of our social click Mike Swainson and pal Bob texted to say they were leaving Metz and would join up with Stephen in Amiens later that evening. By 5.30 we were in our campsite at the Velodrome, Albert and the tent rigged up. Blow up double bed sorted, mains lighting, heater if required, satellite TV up and running, wine poured, I do spoil my girl!! The next morning we were joined by Stephen, Lesley, Mike S & Bob. The start and finish for all the runs and the walk was just a few hundred yards from our campsite so it was easy to recce the start/finish area. 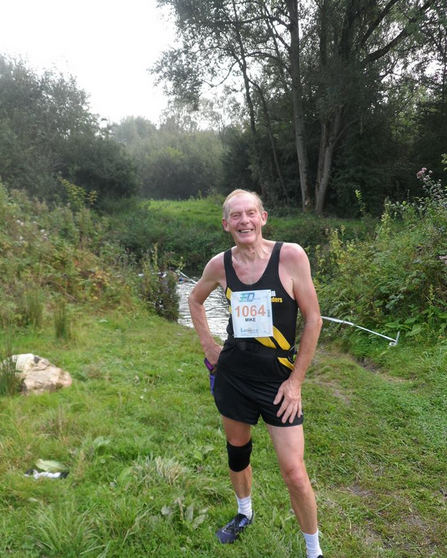 On offer was a Maratrail (26.2 off road) a half Marathon, a 10 and 5K plus a 6.75 mile walk. 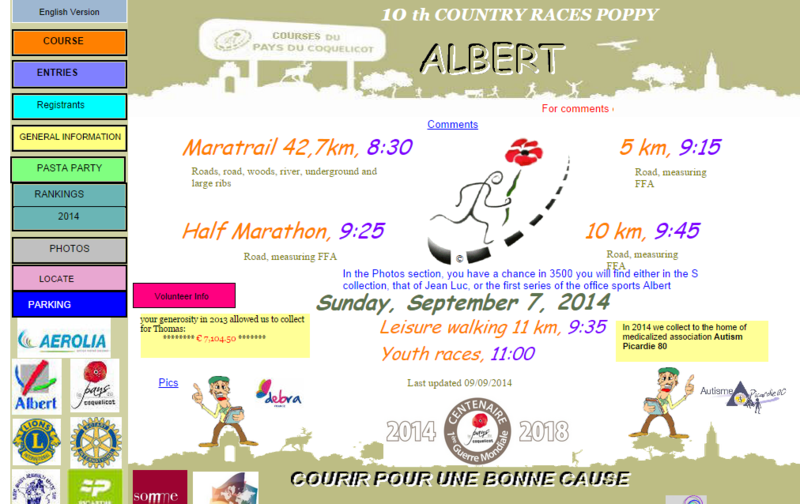 At 10 am runners were invited for ‘a small jogging’ from the centre of Albert followed by a reception for foreign runners by the Mayor and other dignitaries in the TIC, nibbles and drinks provided. Registration started at 4 pm so that left us time for coffee beer and wine and more socialising before we picked up our numbers. The weather was wam and pleasant, the temperature only dropping in the late evening. Up by 6 the next morning for an 8.30 start for me, temp was good about 13/14 with no wind. We had been promised an interesting run and it sure was. 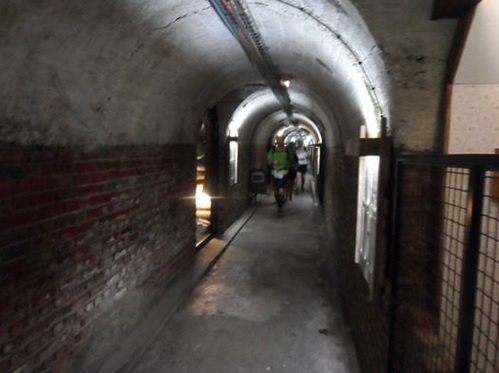 A flat start into the centre of Albert and then down into the underground tunnel network which housed artefacts from the first world war, weird hoofing it through the poorly lit tunnels. We popped out in a park by the river and worked our way through little used parts of Albert before hitting a long grassy bank beside the canal which led us out into open country. With not doing any long runs before hand I started off cautiously as my only object was just to finish the run. There was no major hills to climb but the whole area is undulating so it was constant up and downs, about 90% of the run was off road. At the 11 mile point I reached the Thiepval memoral, a huge edifice designed by Sir Edward Lutyens with the names of over 73,00 British soldiers who perished in this area and who have no known grave. Very sad but a fine memorial. it’s amazing how a bit of support gets you picking up the pace. Shortly after that I ran around the Ulster Tower memorial and paused to take a picture of ‘Tommie’ still guarding the front line since 1916, he ported arms smartly for me. A steep downhill section followed before we had the reverse to do and a long pull up through ploughed fields, very uncomfortable to run over and the legs were starting to feel it. By now I had no clue as to how far I had ran or had still to go as my Garmin which had been iffy for a while had packed in and I had given it to Mike S as I passed him. 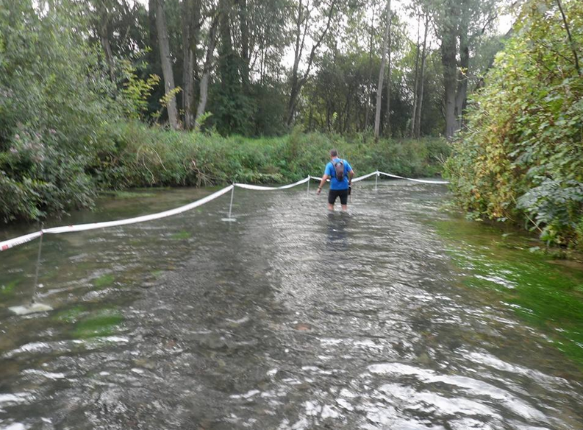 and then we had a river to plodge through for about 100 meters (the Frenchies threw a wobbler and most took off their shoes before entering the river, what’s that about!!) Me I loved the chilled water so refreshing. The temperature had risen and near the end and I started to dream of the cool beers & wines I knew were waiting for us at the finish. Legs very weary now and it was mind over matter to keep pushing on. 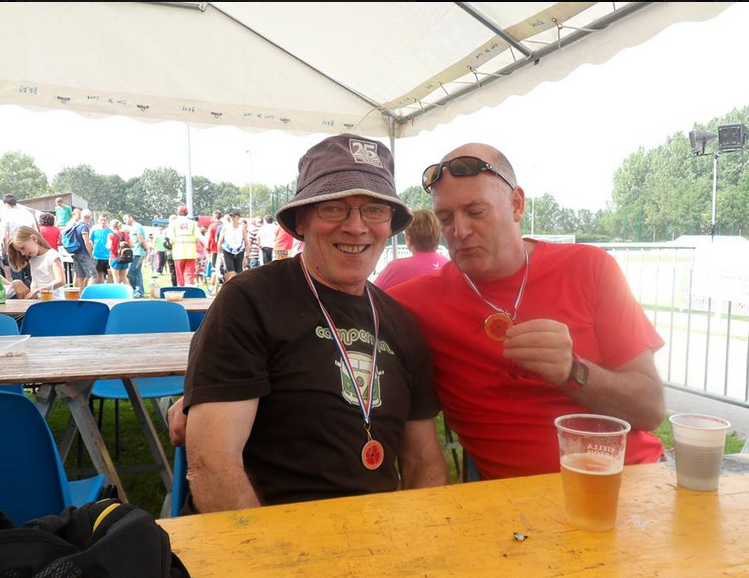 There was only 2 water stations on the way round, Thiepval at 11 miles and Auvley at 21 miles so you had to look after yourself for hydration. I turned into the finish area and broke into a 100 meter sprint which took me over the line (it’s amazing how you can turn the energy on for a short distance and look cool getting over the line but believe you me I was goosed) A slow walk around the finish area to collect medal/t shirt and then a sight for sore eyes Mike S approaching with a ice cool beer for me. The finish area with table and chairs laid out under shade to sit at whilst you drank beer and wines was spot on, a bar b q sizzled away wafting delicious smells. You put your race numbers into a cardboard box and young children drew out random numbers for a free ‘tombola’ there were prizes of garmin running watches, head torches and other running kit altogether a great family type atmosphere. Mike S was asleep in his campervan, something about knocking of two and a bit bottles of red before 3 pm, nah I’ll not mentions that!! 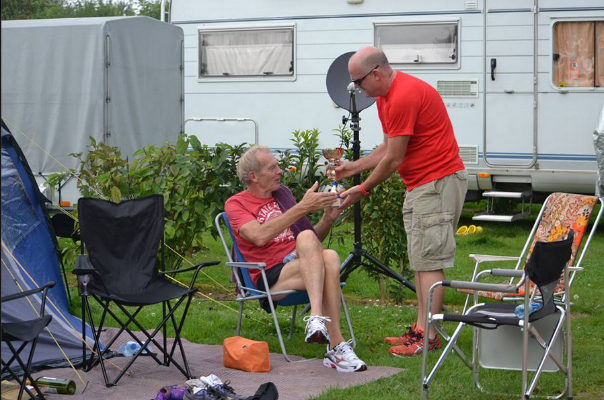 After a while I popped back to the campsite for a shower and whilst I was there Stephen picked up my bling prize and thanked them in his best Geordie French. Stephen and Lesley left for home on the Monday and the rest of us stayed until the Tuesday so more time to enjoy. Well I hope this little blog might enthuse more Bounders to take the trip over to France next year to take part in one of the Poppy Runs. 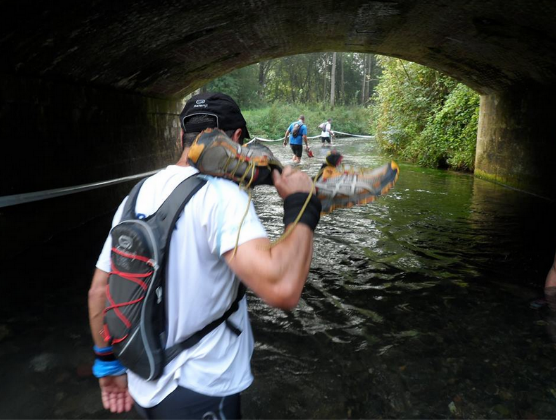 You have a choice of Maratrail, Half Marathon, 10k, 5k and even a walk.